...Snappy Chef offers a wide variety of rental equipment perfectly suited to make your event a spectacular success. Equipment rental through Snappy Chef is just another way we're making party planning easy for you. Whether your needs are simple or grand, indoors or out, Snappy Chef has the china and linen, tables and chairs, tents and so much more for your event. So if it's a complete package you're looking for or just a few small items to make your event complete, let Snappy Chef's team of creative professionals create the perfect rental package for you. Listed below are our most requested china and linen packages as well as individual service items, theme and specialty equipment ideas. Ask your event consultant for pricing and availability of any items not shown here. Snappy Chef offers china and linen packages that are the perfect compliment to our fabulous menu selections. Choose from one of our pre-designed packages or create one of your own from our extensive list of additional rental equipment. China service includes dinner, salad and dessert plates, glass water goblets, coffee cup and saucer and stainless flatware. Tables will also be set with salt and pepper shakers and sugars and creamers. Table linens include overlays for the guest tables, coordinating linen napkins and table skirting for the food and beverage buffets and registration tables. Ask about available linen colors. China service includes dinner plates, glass water goblet and stainless flatware. Tables will also be set with salt and pepper shakers. Table linens include overlays for the guest tables, coordinating linen napkins and table skirting for the food and beverage tables. Ask about available linen colors. China service includes dinner plates, glass water goblet and stainless flatware. Linen and skirting are included for the buffet stations. All paper dinnerware is provided for your guests including heavy duty paper plates, heavyweight plastic utensils, cake plates, deluxe paper dinner napkins, coffee cups and punch tumblers. 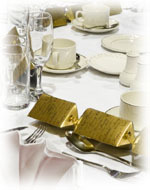 We also will be happy to cover your guest tables with linen or paper table covers for an additional charge. NLinen Tablecloths and Linen Napkins Available in a variety of colors. Special dietary requests are accommodated. Pennsylvania LCB laws prevent Snappy Chef from providing alcohol. Delivery charges and damage waivers may apply. Please ask for a full quote. Snappy Chef works with the best rental equipment suppliers around to provide a wide variety of party and event rental equipment at competitive prices. Ask about portable bars, tents, lighting, dance floors, audio/visual needs, or any other accessories to complete your event. Delivery charges and damage waivers will apply. Please ask for a full estimate. 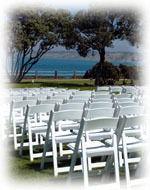 Rental prices not finalized until 30 days prior to your event. There will be a 25% deposit requested for rental items. 10% rental coordination fee will be added to all events. Set up and tear down of tables and chairs not included in fees. Consult your event coordinator to discuss setutp and teardown of your event site. First site visit included with event pricing. Other site visits charged accordingly. For every occasion and every location, Snappy Chef offers a wide variety of specialty rental equipment designed to make every party a success. Ask about portable bars, tents, lighting, dance floors, audio/visual needs, or any other accessories to complete your event.